Prototype:German Railroad, Inc. (DB AG) class 110.3. Express locomotive with aerodynamic ends, the so-called "Pants Crease" look. Rebuilt version with rectangular Klatte ventilation grills, rectangular engine room windows, without a continuous rain gutter, without skirting and buffer cladding. The locomotive looks as it currently does in real life, around 2007. Model: The locomotive has an mfx digital decoder and factory-installed, controllable sound functions. It also has controlled high-efficiency propulsion, centrally mounted. 4 axles powered through cardan shafts. Traction tires. The triple headlights and dual red marker lights change over with the direction of travel, will work in conventional operation, and can be controlled digitally. The headlights are maintenance-free, warm white LEDs and the marker lights are maintenance-free, red LEDs. The locomotive has separately applied metal grab irons. The engineer's cabs have interior details and a separately applied control wheel. The locomotive has separately applied roof walks. Length over the buffers 18.9 cm / 7-7/16. Rebuilt version with Klatte ventilation grills. Without skirting and buffer cladding. 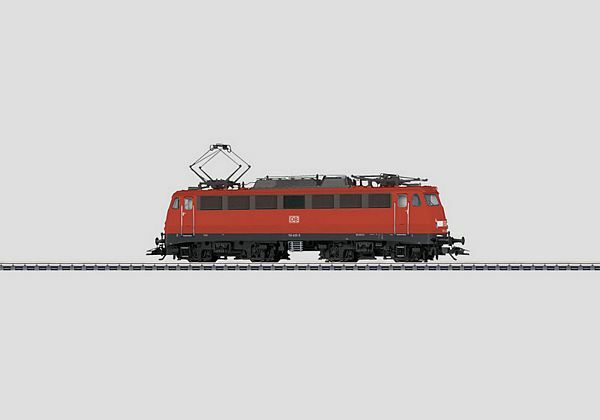 Passenger cars to go with this locomotive can be found in the Marklin H0 assortment under item nos. 43801, 43811, and 43830.